Once every winter my family, and my husband’s siblings and parents, all try to meet for one week at the Carimar Beach Club (800/235-8667, 264/497-6881). in Anguilla. Anguilla is only a one-hour flight from Puerto Rico and very near to St. Maarten, and the Carimar is next door to the deluxe Malliouhana Hotel and very near the CuisinArt Resort. We think of it as our secret because it’s much more reasonably priced and friendly than its neighbors, and the entire staff is incredibly nice, remembering the kids’ names, being cheerful, etc. There are only 24 condos in white two-storey buildings around a very nice lawn. We always stay in the same great two-bedroom unit overlooking Meads Bay beach so we can be near all the cousins. When we tire of playing on the soft white sand beach outside, we can snorkel (there’s scuba too). Thankfully, there are chairs and big beach umbrellas for everyone so we’re not in the sun too much, though I must say the weather always seems perfect when we visit Anguilla. The island is flat so it doesn’t hold weather the way St. Maarten does. The beach, the pathways and the beautiful gardens are tended to constantly and are very clean. There’s a nice spa where I’ve had very good massages, tennis courts, and horseback riding nearby. 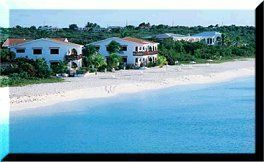 Anguilla is a very nice island with many excellent restaurants (no restaurant at Carimar but full kitchens in each unit). The art galleries aren’t great but the beaches are beautiful, and the people are friendly and kind, so we enjoy driving around and dining out with the kids. One of the best things about it is how our boys (now ages 6 and 8) have plenty of freedom to roam. They just love it. Ilene Lanier is from New York City.